Mosaic Cycles, also known as Mosaic Bespoke Builders of Boulder, CO was one of the three frame companies who descended into Louisiana for the Rouge Roubaix gravel race, selecting lucky racer Derick Yarra to not only join them in the race, but also to receive one of their custom bicycles. At the 2013 NAHBS, we examined Mosaic’s award-winning cyclocross bike, and enjoyed riding it so much afterward, we gave it our Editor’s Choice Award for Dream Bike (you can get a copy of the back-order here). This year, we caught up with the frame builder once again to go over his cyclocross frames, including a singlespeed model used by the local Boulder team, Singlebarrel, and their GS1 gravel frame. Aaron Barcheck is the heart behind Mosaic Cycles. He learned the craft working for Dean Titanium in the past. He also races cyclocross and competes in gravel races, too, and you can find him in the results of the Rouge Roubaix gravel race that took place last weekend. Barcheck was a speedskater in his youth, and once raced Olympian Apolo Ohno as a kid. Looking at their display in 2015, we can tell that Mosaic is becoming a family affair with his younger brother, Jack, helping with the building and their father, who helped man the booth at NAHBS. Mosaic’s models are now named based on their intended use and the materials they’re built from. The XT1 stands for cyclocross titanium, with 1 being the top-of-the-line model for titanium with double butted tubing. We shot some images of this model at NAHBS, which happens to be Liz Barcheck’s (Aaron’s wife) racing rig. The XT2 on the other hand, is their classic titanium model with straight gauge tubing, not shown in the slider. The XS1 Singlespeed shown below was made using light True Temper OX Platinum tubing, except for the chainstays, and 14 of these models were built for the Singlebarrel singlespeed cyclocross team. Cyclocross is big part of Mosaic’s business, making up a third of their total bikes built. They also do road, mountain, travel and gravel bikes along with stainless steel options. Everything they make is custom and made to measure. This year, we took an extensive look at their GS1: A gravel steel frame using True Temper S3 tubing (except for the chainstays). 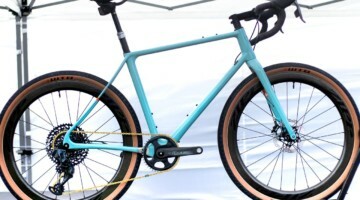 The frame’s typical geometry includes 42cm chainstays and a 70mm bottom bracket drop, which is about 1cm lower than their typical cyclocross bike. Still, it’s important to remember that all of their geometry is customizable. The GS1 comes with rack mounts and a fork from Ethic Industries, and Barcheck told us he considers the model a road bike with clearance for fat tires, as opposed to a monster cross bike. Mosaic is building about 250 bikes a year, and currently has a six week wait for titanium and eight weeks for steel. They have a growing dealer network, but do some direct sales when necessary. The model pricing varies. 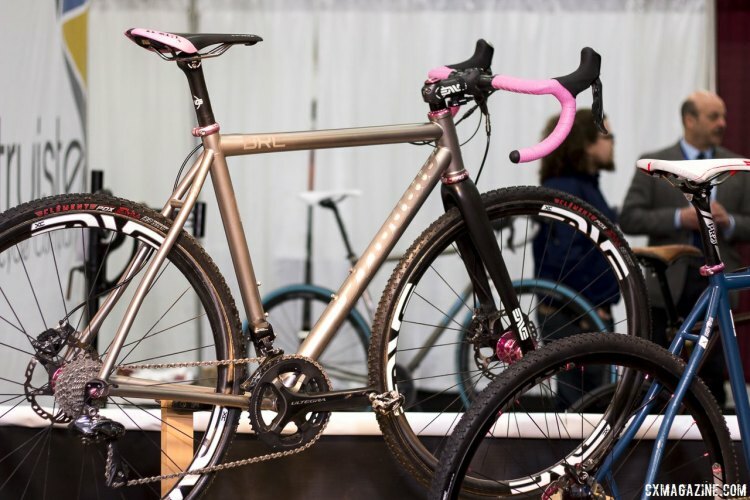 More information: mosaiccycles.com, be sure to look at our ever-growing list of cyclocross and gravel bikes from NAHBS 2015. They need to spell check your name there buddy! Aaron Bartock really is our best kept secret. That guy’s mad pro. Really nice, but why not use Industry 9’s single speed hub on the XS1? Sorry for unleashing the mystery man, Mosaic Cycles. We went back and covered Bartock’s tracks. His secret is safe with us.